I have decided to start offering a sword customization service. Making full custom swords will remain my main business branch but I will consider doing smaller customizations along the way. I will perform all customizations with the same utmost care that I make my own swords with. Whereever it is required to take power tools to a heat treated blade, I ensure by careful work, frequent cooling and going slowly that the sword‘s temper is not affected. The first one is what I call „basic sharpening“. It consists of sharpening the blade via slack belt sanding, up to 3000 grits followed by leather stropping. 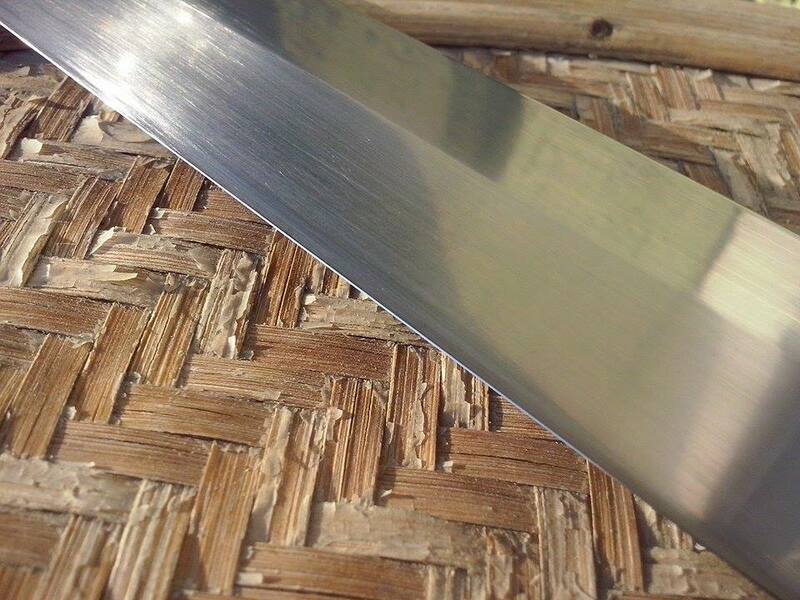 This results in a very sharp „apple seed“ edge that cuts perfectly well but leaves a visible change in finish compared to the main body of the blade. There is no actual step in the blade geometry as it would be the case with a secondary bevel but the first few mm of the edge sport an almost mirror cross-wise polish. I would suggest this for lower end blades such as Windlass, Del Tin, etc or higher end blades that are only intended as cutters. The price for the „basic sharpening“ is 25 Euros per edge over 40cm in length. A long double edged sword would be 50 Euros then. The second option I call „premium sharpening“. The rough work is also done with the belt sander but I refine the edge by hand using progressively finer grits of sandpaper and afterwards a fine stone. The last step is again stropping on a leather belt. This also results in a mirror polished last few mm of the edge but as you can see in the pics, it‘s very suble compared to sharpening solely with a slack belt as it lacks the across-grain marks from the grinding belts. Such an edge cuts wonderfully and is also very aesthetically pleasing. 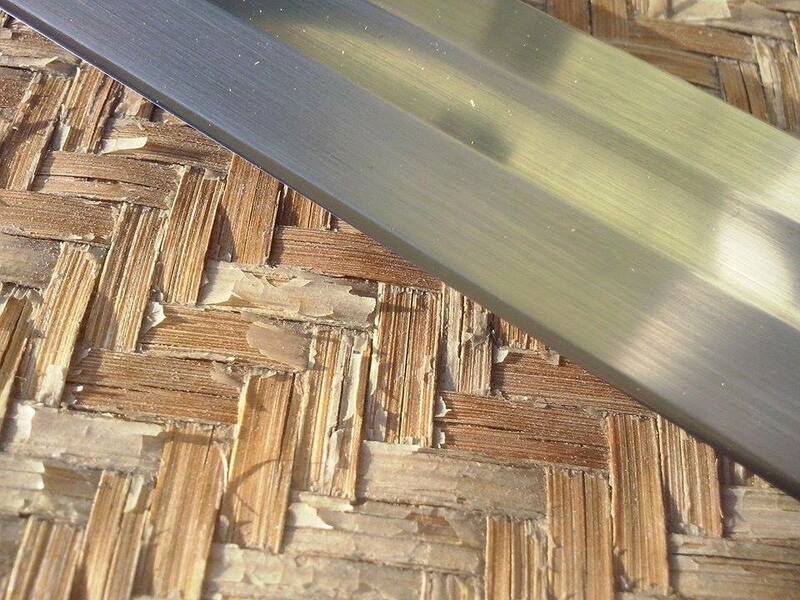 This is the type of edge my own swords sport and what I would recommend for any high end swords such as Albions, ATrims, etc. 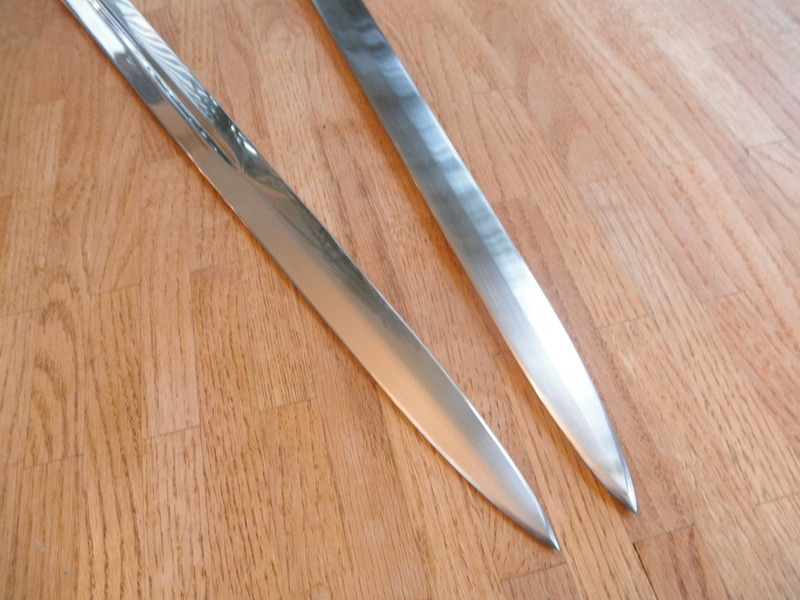 The price for the „premium sharpening“ is 50 Euros per edge over 40cm in length, resulting in a price of 100 Euros for a long double edged sword. If your sword is already sharp (with the proper geometry) and only needs to be touched up, I will not charge the full price. Also, if your sword sports such a thick primary bevel that in order to reach sufficient sharpness substantial blade re-grinding is necessary, we will have to discuss a higher price. I offer the shortening of blades (of course with a new tip being ground) as well as all kinds of other re-grinds, for example thinning down an overly thick blade that lacks proper distal taper, giving a blade more profile taper, a new tip shape, etc. I can also re-grind a blade to clean up the geometry, remove forge waves, etc. The price for this service varies substantially, depending on the exact project. Naturally, a re-grind can also be coupled with sharpening the blade. 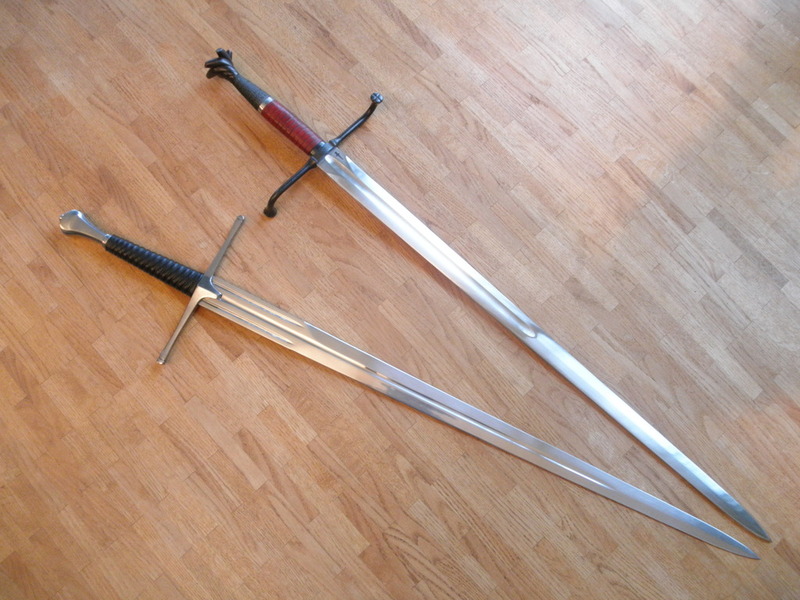 As an example, here is a Windlass Sword of Roven and a Lutel that were shortened and had pointier tip profiles ground in. The edges were left with a machine finish, the primary bevels remained un-touched (possible here as both blades were not shortened very far and of the same thickness there as at the original tip). The price for something like this is 50 Euros per sword. If these were more expensive blades, I would have suggested blending in the edges by hand to match the finish of the blade. This would naturally result in a higher price. In general, I‘m open to all kinds of requests. If you have a sword where a certain thing bugs you, get into contact with me, we might be able to find a solution. Bent blades can be straightened, oversized pommels re-ground, loose guards wedged in place, new grips installed,... many possibilities there. I do not plan on offering a re-hilting service though, at least not at the moment. I do not yet have an equipment that allows for a fast, cost-efficient way of making new fittings (especially pommels). My turn-around time for customization work is fairly short, you should have your sword back within a couple weeks. In times of exams or if I‘m otherwise busy, I will of course let you know.